As someone who was injured in a truck crash, or lost a loved one in a crash, you deserve to have an experienced advocate at your side. While the trauma of this event may feel overwhelming, you can rely on our compassionate attorneys to handle all aspects of your claim. You deserve maximum compensation and justice for how this accident has affected your life. 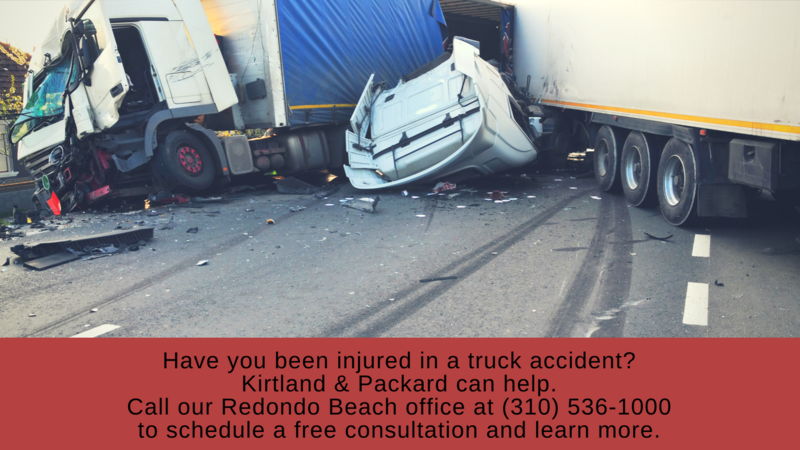 To learn more about our experienced Redondo Beach, Torrance, and South Bay truck accident attorneys, please call Kirtland & Packard for a free consultation at 310-536-1000. Was Truck Driver Fatigue a Factor? If you were involved in a serious truck accident and suffered injuries as a result, or if a loved one was killed in this type of accident, then you may have a truck accident case. The only way to know for sure is to contact our experienced attorneys for a free consultation. Generally speaking, if the accident can be traced back to someone else's negligence, then you deserve the opportunity to seek compensation and accountability from the responsible party. Thousands of people are killed in truck accidents each year in the US. Most of these people were the occupants of smaller vehicles; a lesser percentage are the truck drivers themselves. Hundreds of thousands more people are injured in these accidents. These alarming numbers demonstrate just how catastrophic these accidents are. Because of their massive size and weight, tractor-trailers can easily cause devastation when they crash. When it comes to major truck accidents, the driver of the truck might be directly at-fault, but full liability rarely rests completely on his or her shoulders. A truck driver is an employee, a cog in a large, complex machine. As such, liability might reside hundreds of miles away from the scene of the accident. Truck drivers are asked to meet grueling, sometimes unrealistic, schedules and drive long distances in short periods of time. There are federal regulations on their working hours, but many trucking companies demand too much of their drivers in order to cut costs and increase profits. As such, trucking companies can be held responsible for the mistakes of their drivers, especially if it can be demonstrated that the mistake occurred as a result of the driver's exhaustion. Making this argument requires a keen grasp of the physiological and regulatory issues involved. That's something we've acquired during our decades of work as truck accident lawyers. Research has shown truck driver error to be one of the most frequent causes of crashes. Things like distracted driving, drugged or drunk driving, drowsy driving and speeding are just some of the ways a driver can cause a wreck. Truck driver fatigue is the leading preventable cause of truck crashes in the United States. However, unlike alcohol or drug use, there is not a way to test truck drivers in the aftermath of a crash for fatigue. Because we are left guessing, it is likely that fatigue is under reported and a likely factor in far more accidents than often recognized. 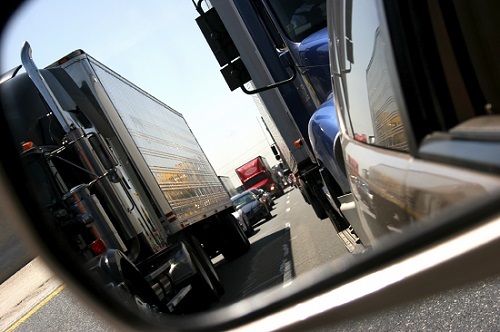 Building a strong case following an accident due to truck driver fatigue can be challenging. Our attorneys have the experience to dig into the details of the case and help you determine liability. The National Transportation Highway Safety Board (NTSB) conducted research that suggested that "truck driver fatigue may be a contributing factor in as many as 30 to 40 percent of all heavy truck accidents." The effects of fatigue rival the dangerous effects of speeding or driving under the influence. Economic Working Conditions: Drivers of commercial trucks are under tremendous pressure to get their cargo to the destination on time. Many truckers are even paid by the mile, so there are strong incentives for staying on the road as long as possible. Truck drivers are exempted from the Fair Labor Standards Act, so they are not entitled to overtime pay like most workers in the US. To make matters worse, there is intense competition throughout the industry to cut costs and out-compete other trucking companies and independent drivers. Low wages and stiff competition is a recipe for pushing truck drivers and companies to bend the rules—sometimes with disastrous consequences. Physical Properties of Big Rigs: The sheer size of big trucks makes them far more dangerous to other drivers on the road. When the driver of an 80,000-pound commercial truck is fatigued, there is a much greater likelihood that any crash will turn fatal or cause significant injuries. According to the National Highway Traffic Safety Administration (NTHSA), big rigs make up only four percent of the vehicles on the road, but they are involved in more than eleven percent of fatal accidents. Much larger, longer, heavier trucks are very difficult to steer or control when situations do arise. While a fatigued car driver may drift into the rumble strips and suddenly wake up to correct their trajectory, a truck driver often can’t remedy the situation quite so simply. In other words, while a truck driver may have been operating his vehicle while fatigued, the liability might not stop with him. If the trucking company violated federal regulations or pushed for an unrealistic schedule, it might be as liable for the accident as any individual driver. Our attorneys have successfully recovered compensation for numerous accident victims over the years, as you can see in our verdicts and settlements. If a loved one is killed, you may be an eligible family member to pursue wrongful death damages. A successful wrongful death case helps the bereaved pay for their loved one's end-of-life expenses, including funeral and burial costs. It may also award compensation for the loss of the loved one's income and financial benefits, as well as other things. Not only can these claims provide the financial compensation family members need and deserve, it can also provide closure in the form of holding the responsible party accountable. Our experienced, aggressive attorneys do not back down to trucking companies or their powerful insurance representatives. If you want to know if you have a case, please call Kirtland & Packard for a free case evaluation at 310-536-1000. We fight tirelessly on behalf of truck accident victims in Redondo Beach, Torrnace, South Bay, and all of the surrounding areas. To contact us, you may also fill out the form at the top of this page.